It's quite common to become a bit forgetful as you grow older. Nevertheless, memory loss could be a symptom of something more severe. 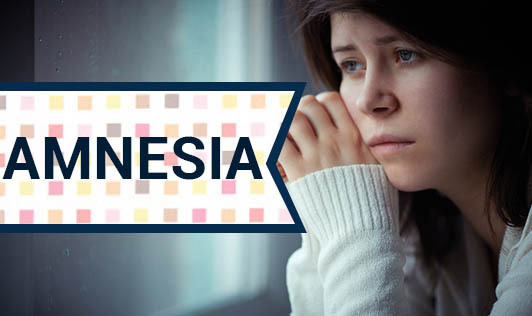 Amnesia refers to loss of memories including facts, experiences and information. Real life amnesia generally doesn't cause a loss of identity. People with amnesia may have trouble learning new information and forming new memories. Depending on the cause, memory loss may have a sudden or gradual onset and it may be temporary or permanent. Anterograde amnesia- Inability to recall recent events after the incidence of trauma or the onset of the disease that caused amnesia. But the collection of events in the distant past is unaltered. This type of amnesia is most common in people suffering from Dementia or Alzheimer's disease. Retrograde amnesia- Inability to recall past events before the amnesia started. However, people with this type of amnesia can create, form and recall memories from the point of amnesia and forward. This can be caused by a severe blow to the head, for example a car accident or a fall. It can also be caused by stroke or drug abuse. The parts of the brain where the past memories are stored are damaged and cannot be accessed by the brain anymore, as a result causing amnesia. Transient global amnesia- This refers to complete memory loss that can last from minutes to several hours, often seen in middle-aged to elderly people. An individual may be disoriented to time and place and may recognize that something is wrong and may become worried at this realization. Emotional/hysterical amnesia- Memory loss that is caused by psychological trauma. This is usually a temporary condition. Korsakoff's syndrome- Memory loss that is caused by chronic alcoholism. Lacunar amnesia- Inability to remember a specific event. Posthypnotic amnesia-This occurs when events during hypnosis are forgotten or where past events cannot be recalled. If you or a loved one experiences unexplained memory loss, head injury, confusion or disorientation, you should seek medical help immediately!